Arsenal have confirmed a major injury boost with Sokratis back ahead of schedule while three other players are also back in contention for the trip to BATE Borisov tomorrow. Sokratis has missed our last three matches since suffering an ankle injury during the FA Cup defeat to Manchester United on January 25th and he wasn’t expected to be back playing again until early March. 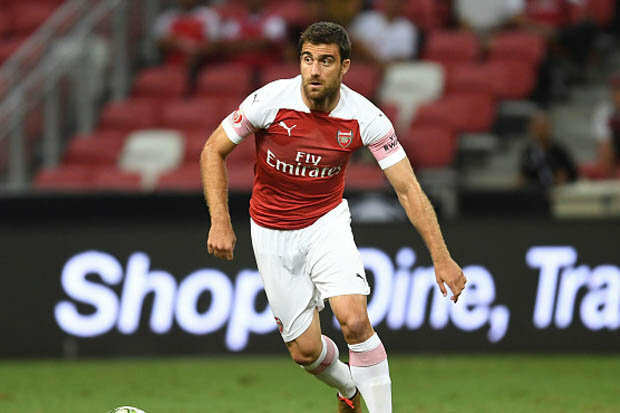 However, after resuming light training last week, the club have now confirmed that Sokratis is back in full training so the Greek international could be involved against BATE tomorrow evening. There is also good news on Pierre-Emerick Aubameyang as the Arsenal striker is also back in full training after missing the victory over Huddersfield Town on Saturday due to illness. Mesut Ozil is another player back in contention after he too sat out the Huddersfield game with illness while Granit Xhaka is in full training again after recovering from a groin problem that’s hampered him recently. However, Aaron Ramsey will need to be assessed ahead of Thursday’s Europa League clash at BATE as he’s still nursing a knee injury so the midfielder could miss out along with long-term absentees Danny Welbeck, Hector Bellerin and Rob Holding. In full training ahead of schedule. Right knee. Being assessed ahead of BATE Borisov (a). It’s a major boost to have Sokratis back but I’m not sure I’d risk him against BATE tomorrow evening. It may make sense for him to miss the trip to Belarus and make his comeback in the return leg at the Emirates next week. However, I would like to see Unai Emery take a strong squad with him tomorrow as we don’t want to take too many chances and the Europa League is a realistic route back to the Champions League for Arsenal. There is no excuse to rest too many players as we don’t have any game this weekend so let’s hope we see most of our big guns feature tomorrow and bring home a healthy lead for the second leg.